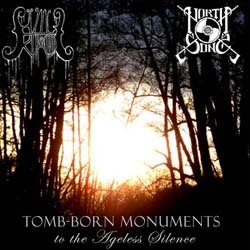 Hvile I Kaos and Northsong, 2 interesting one-man projects from USA have announced the release of a split album, entitled “Tomb-Born Monuments to the Ageless Silence“. It will be a digital only album and its expected by the end of January 2014 on Tunecore, so it will be available on iTunes, Spotify, and AmazonMP3 and it may be available in other places as well. Northsong is an atmospheric symphonic folk / Viking metal solo project founded by Cortland Runyon in 2010. The band released the EP “Winter’s Dominion” in 2011, the full-length album “The Final Journey” in 2013 and a 3-track single “Forgotten Tales” also in 2013. Hvile I Kaos is a cello-driven melodic black metal project, founded in June 2011 by the classically trained yet metal-obsessed cellist Kakophonix (Chris Edward Brown) and has released only an eponymous EP in 2013. “Tomb-Born Monuments to the Ageless Silence” comes with a PDF digital booklet, created by Cortland. Cover artwork and album tracklist are already revealed.